Ferruccio Lamborghini, and what he started, have sometimes come in for criticism over the years, either through simple jealousy (how dare he threaten the establishment), or because his cars were seen as too self-indulgent. The cars his purpose- built factory at Sant’ Agata gave the world were not perfect, far from it, but I do believe what he and his brilliant young team (Paulo Stanzani, Gian Paolo Dallara and Bob Wallace) achieved can easily be underestimated. It is ironic that Ferruccio himself was by all accounts a man who liked well developed, smooth and refined cars, given what came after the original 350 and 400. I have discussed with both Tonino and Fabio Lamborghini over several lunches and Proseccos the real reason why Ferruccio diversified into motors. This exceptionally driven man did not originally set out to make other-worldly cars. He simply had a Ferrari 250GTE luxury coupe with a clutch that for whatever reason consistently (and in fairness to Ferrari abnormally) failed and resolved to do better. The radicals, such as the Miura, Marzal and Countach that came immediately after the 350 and 400 “conventional” coupes, were in no way in his original vision and brief. He was said to have shuddered visibly when Nuccio Bertone first showed him the Marzal, for example. It is a tribute to the infectious enthusiasm (not to mention creativity and brilliance) of the aforementioned trio and to his open- mindedness that the “super” cars are now his most celebrated. Was that striving for refinement really lost in all the excitement? In one area, the heart of the machine, certainly not. The Bizzarini-penned V12 more than anything exemplified Ferrucio’s aspirations. Its blend of qualities were unique for the time, 1963, and almost unachievable technically. 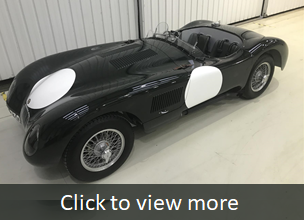 Such ingredients as very high specific power (bhp/litre), the revs needed to achieve it, torque, docility, mechanical quietness and longevity are a recipe that just doesn’t mix……or shouldn’t. Architecturally, the original V12 was “right” from the word go. This may seem an obvious statement, but I assure you it is, alas, not necessarily the case. I couldn’t even begin to recount the number of times early in my career that I stripped and examined in detail for the first time a landmark engine, only to be shocked at how many obvious basic deficiencies there were in its design; at least some of them were genuinely avoidable with little or no cost penalty. Conversely there is something refreshing in observing in other instances that great minds have been let loose, and the result, in a way, makes it look too easy, because they consistently chose the right solutions on the drawing board- the clever ones. It is this rare engineering elegance that sets apart Giotto Bizzarini’s V12 design. To devise a cam profile high enough to open the valve for power at over 7,000rpm, (in the region of 9mm+ valve opening at that time) but gentle enough to be all but silent, was exceptional. This is because big valve lift takes a bigger lobe, or point, and that takes up more space as it runs around to work properly. But quietness demands gentle “introductory ramps”, the part of the cam that takes up the clearance and lifts the valve/ rests it back on its seat, and long ramps take up space too. So if short ramps are used, you get clatter, and if small lobes are evident, the combustion chamber can’t breathe enough. When set-up properly the original Lamborghini V12 is notably mechanically quiet at low revs, but can deliver the goods at full chat too. This was a compromise that other engine makers could not reach so successfully. 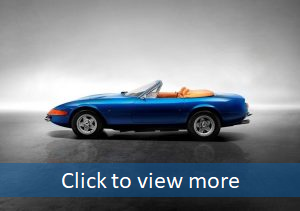 Probably the one that came closest was Ferrari with the beautiful 4-cam 275, like Lamborghini up to 91 bhp/litre by the time it came out in 1966, but the fabulous Daytona that followed is in no way quiet at idle! Add to the mix negligible maintenance (the tappet clearances on the Lamborghini V12 can go on in service unadjusted for many tens of thousands of miles), and this was a combination to which others could only aspire. I would flag-up a cautionary note regarding claimed power outputs of high powered engines by any maker in the heady 1960’s-they are just about as dependable as someone else attempting pasta just like Mama makes! It is well-known among a wider audience now that sodium- cooled exhaust valves were default-standard for high performance road car engines in the early 1960’s and beyond. This technology was introduced in the hard school of aircraft engines in the late 1930’s, which ran at a maximum of 3,000 RPM, albeit with big valves and short times between overhauls. How does that translate to a high- performance road car engine a quarter of a century later, used with higher revs for many tens of thousands of miles? Pretty good, but not the best….. The choice of solid exhaust valves, not hollow stemmed sodium-cooled, was a potential trouble spot eliminated at a stroke. Why? Because sodium-cooled valves have a hollow stem, with a shot of sodium that bounces up and down, repeatedly transferring heat from the head to the tip and thence through the spring to dissipate. The hollow stem is friction welded to the valve head, and there’s the problem. Over a period of time corrosion and/or metal fatigue sets in (metal fatigue only happens under tension, not compression, and the valve is mostly under tension), and your beautiful Italian (or whatever) masterpiece goes clunk with a dropped valve head quicker than a queue forms for free drinks. Ing. Giotto Bizzarini, or whoever specified the material, thought out of the box and went for something far, far better. The exhaust valves in Lamborghini’s V12 were made of solid Austenitic Stainless Steel (SAE EV11, to nail it), and the heads were coated with Stellite-F. This simple decision alone elevates the longevity of Ferrucio’s motor way above its peers, and brings it far closer to his 100,000km dream. In the heady days when second-hand Italian Exotic engine parts were more readily available than they are now, I condemned many a cylinder head because of exhaust valve failure- now they would be repaired, almost no matter how badly damaged. Not wishing to worry anyone, but I could suggest a service life for sodium valves as low as 30-40,000 miles. Just to prove that Lamborghini themselves were not infallible, the four-cam Urraco P300 used what kind of exhaust valve? You’ve guessed it…. I can only think it was the new guard at Sant’Agata in the early 1970’s, or simply cost-cutting, as the company was in trouble by then. Ferruccio had left the building…. The valve timing on Lamborghini’s V12 was again masterful. Achieving high power at high revs was no secret to an engine designer by the 1960’s. To get max. power gas flow is king, with large “overlap” between inlet and exhaust valve timing. Overlap simply means that the inlet valve opens shortly before the exhaust valve closes, thus the escaping exhaust gases’ inertia “pulls” more of the fresh inlet charge into the combustion chamber. An engine with large overlap can be identified by very “rippy” throttle response high up the rev range. But what about at lower speeds? That very overlap, without the vacuum of fast exhaust gases going out, becomes pressure and can in extremis push the next charge back out the inlet. That’s why a racing version of a standard engine is anything but clean running low-down- often they run roughly and need to idle considerably higher than standard. Conversely, an engine intended to run smoothly low- down works best with no overlap, and preferably keeping the inlet/ combustion/ outlet processes as mutually exclusive as possible. Plenty of engines of this era could combine power up to 5500-6000rpm with a smooth idle at, say 800-900 rpm, but power up to virtually 8000 rpm and a smoothness and quietness at tickover that was comparable to a luxury saloon’s as well? Nobody did it better. The classic two- valve hemispherical combustion chamber was a staple solution for fast road car engines from the 1950’s through to the 1980’s. It was used for good gas flow and flame propagation, because the roof was fairly smooth and free of obstructions and the spark plug was in the middle. The inlet port profile that worked best with this was in from the side of the head. The mixture travelled in a relatively straight line and skimmed past the open inlet valve. An alternative route was for the port to come from the top of the head, in between the camshafts for example, down onto the inlet valve. The main difficulty with this is that the inlet gases “hit” the valve and then have to travel around it to get into the combustion chamber. In certain applications this can be advantageous, (greater atomization is achieved through swirl in having to go around the obstruction), but not normally for high power applications, as a flow bench can prove. One specific example of this is that Ferrari used the “sideways port” system for the Daytona in the late 1960’s, but then adopted the “downward” port for their otherwise almost identical but more de-tuned 365 GT4 2+2, and 365GTC4 and later 400 engines. Once again Bizzarini and Lamborghini made this system provide the best of both worlds against the odds. 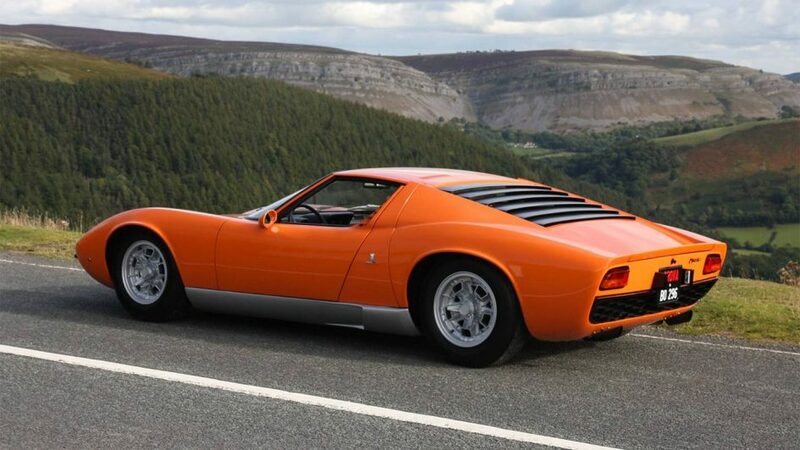 The engine did suffer from foreshortened life span – in the Miura particularly. This is not the basic design’s fault per se, more underdevelopment and compromises brought about by its hasty introduction and compact installation, combining to cause, amongst other things, a less than perfect constant oil supply. A life of as little as 20,000-25,000 miles between rebuilds is consequently not uncommon. In the final analysis, however, Lamborghini used essentially an unchanged 4-litre V12 to power some of the fastest and most avant-garde road cars in the world for more than 15 years. That in itself was a towering achievement. Bravo ai signori di Lamborghini! “A Symphony of moving parts”.